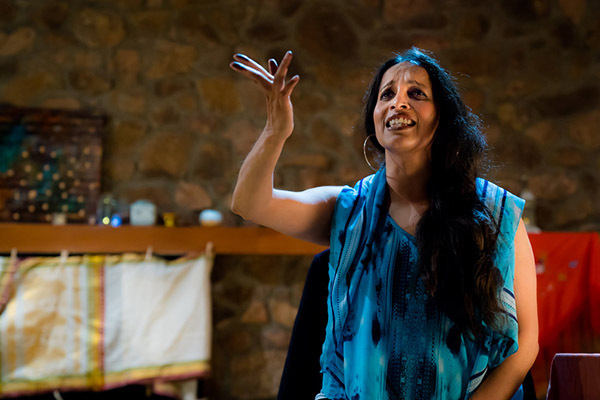 Shebana Coelho is a writer and performer originally from India who now resides in Santa Fe, NM. 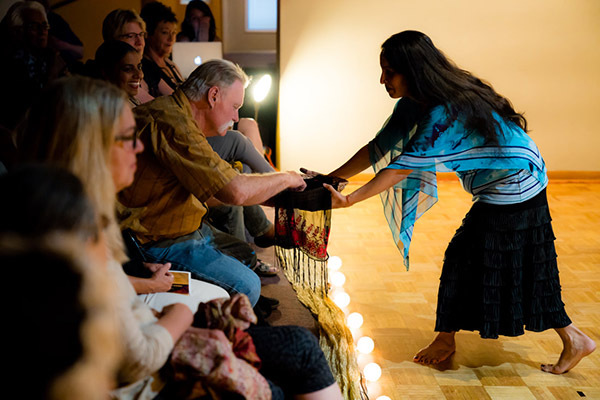 Her current project, The Good Manners of Colonized Subjects, combines flamenco, Sanskrit theater and spoken text, and explores themes of colonization, indigeneity and resonance. Tell me a little about your dance history. My dance history is brief. My first creative enterprise was documentary filmmaking. Then I began writing short stories and fiction in 2001. My journey has mainly been as a writer. What shifted is when I literally moved; I began to travel. That began moving things in me, particularly the idea of space. The geography inside me shifted. My first encounter with dance was salsa while in Mexico. Salsa is what led me to flamenco. I don’t remember what compelled me to take my first flamenco class but the impulse felt very visceral. Later I learned of its roots in India. I began studying flamenco in New Mexico in 2010, and then also studied in Spain. It was fierce, like something woke up in me. I had taken classical Bharatanatyam in India when I was very young, but not in a way in which it entered my body. In 2016, I saw an announcement for workshops in India that called to me – they drew on the Natya Shastra, an ancient treatise and manual on the dramatic arts that dates to approximately 200 BCE. So I went for about three months. The most remarkable workshop I took was at Natanakairali Arts Center in Kerala, with G. Venu, a famed practitioner of Kuddiyattam, a 2000-year-old Sanskrit theatrical form that features elaborate eye movements, mudras (hand gestures and stances) and recited text to the accompaniment of drums. Every day, for three weeks, he led us through intense eye exercises, improvisations and choreographies to understand a core teaching in the Natyashastra: the nine primary emotions, nava rasas, that the sage Bharata had deemed as essential to the art of theater and performance. As a performer, how do you feel emotions, how do you manifest them, and how do you cause them to be felt in an audience? How do you submit to the depth of emotions and how do you move seamlessly between them? I also studied at Adishakti Theatre Arts, Pondicherry, in their Source of Performance Energy workshop which teaches basics of a performance methodology developed by Adishakti: breath, emotion, rhythm centers and voice. I came back feeling transformed but not knowing what I would do with all this or when. How did you begin making your own work? In 2014, I found myself really inspired by theater. I started writing and directing. I wrote a one-act that was produced in New York, and then I wrote a play, When the Stars Trembled in Río Puerco, that was presented in Santa Fe and Albuquerque. I have a few other unproduced plays too! Also, around that time, I began writing poetry and speaking it at open mics. A big event for me was performing stories with Larry Littlebird (Laguna/Kewa Pueblos), a master elder storyteller, in Heirloom Food and Story, a collaborative storytelling performance and dinner, produced by his wife Deborah Littlebird. It celebrated two cultures: East Indian and Pueblo Indian. And then I wrote this poem, The Good Manner of Colonized Subjects, and I knew it was something that needed to be performed. I knew flamenco would be part of it, because it’s about being “frozen with fear, even when dancers come to call.” When I was studying flamenco, I was often performing in student recitals and private gigs, here and there. The feeling of being onstage registered in my body. Can you tell me about your process combining dance, theater and text? In a way, it comes naturally to me to mix things, as I am half Catholic, half Muslim, and I moved from India to the United States when I was young. But it was when I was traveling that I really found my voice. I had many encounters with indigenousness, which woke up something indigenous and true in me. Once I felt the power of the eye movements and gaze in Kudiyattam, I wanted to punctuate the spoken word and the dance with this kind of silent kinetic eye movement. I also knew I wanted to do flamenco barefoot. I was dealing with the origins of things in me, and to have my feet on the earth felt rooted. I feel like – and I am – such an apprentice in the forms I am playing with – flamenco and Sanskrit theater. At the same time, the body knows how it wants to move, and I believe in the truth and freedom of what my body wants to say. I believe in listening to the authority of my body. I went through this whole process where I didn’t feel like I’d been studying these forms long enough to do anything with them. One of the first songs in The Good Manners is a Siguiriya. When the flamenco choreographer I collaborated with, Alice Blumenfeld, brought the music to rehearsal, I said, “Don’t you have to die first to dance that?” Usually, it’s attempted only after you’ve been dancing a long while. A Siguiriya is a compás of 12 broken into five unequal beats, and is one of the oldest, most profound palos in flamenco. It really moved me, and Alice assured me I didn’t need to die first to use it. She showed me three pasos, steps, that I use as the base in my choreography. I had to get over the feeling that I had no right to use it. 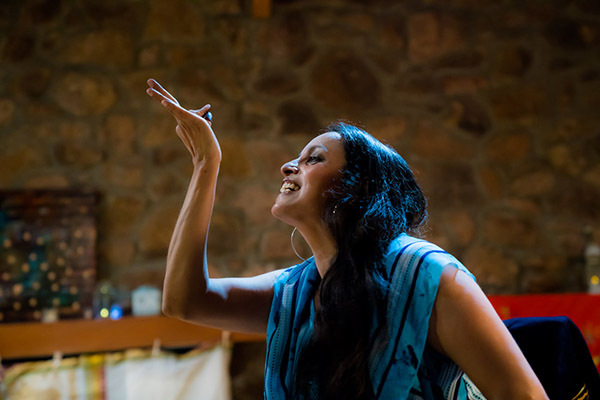 Similarly with Sanskrit theater, the practitioner I collaborated with, Aparna Sindhoor, is so steeped in classical dance and, at the same time, she’s also fierce and free about the form, including the right for others to create from it. The Good Manners deals in part with the cultural colonization of India. I feel like I’m a created class, meaning the British meant to create a group of interpreters who spoke English well enough that it would help them govern the rest of India. English is my first language. That’s how I grew up in India. I began with elocution, how I speak, because it’s a function of the British being in India, and it felt like a good dramatic device to delve into history. I also wanted to use quotes from primary sources, like the actual speech from Lord Macaulay talking about how the British meant to educate Indians. It was in the process of doing this that I realized that they meant to create someone like me. Then, there’s this cave theme. I’m absolutely enamored of that moment in the Upper Paleolithic when the first beautiful images of animals were drawn on cave walls. Incandescent images, feeling bursting out of the skin to express feeling, to create. This idea of caves, dark, light and shadow has been with me for a very long time. When I perform, I don’t want there to be cultural markers; I’m the ethnic person. I want there to be light and shadow around me. In terms of finding the narrative form, I was also encouraged by Larry and Deborah Littlebird of Listening Ground. Larry would often say, “Don’t forget to remember that what you are doing is play.” And so I played… There’s a lot of improvisation in the piece. Sometimes my only instruction is to begin with “water” and end with “cave.” I want to keep these holes where words come out in the dark. There’s a lot of conversation in dance these days about “decolonizing the body.” Do you feel you’re trying to decolonize yourself? I teach creativity workshops that use material from different languages and cultures. These are mostly writing, but also include movement, theater, silence, dance and play. It’s all about: What is the story only you can tell? My piece is about the story only I can tell, because it contains my truth. I don’t mean true as in that it happened, but true as in resonance. I believe that if I go to the necessary depth to tell my resonant story, my hope is that it will inspire others to a resonant depth of listening, creating and connecting. When I say decolonizing, I mean getting rid of the foreignness, whatever is not indigenous to my spirit. It has less to do with culture, because I believe in the fluidity of cultures and communities, and I feel connected to many different places. It’s about finding an openness. Where do you want to take your work from here? There are certain things I know. I need to commission original music, ideally in Spain and India. For the works-in-progress shows, I used recorded music. I also want to create a mobile set. I want to perform The Good Manners in both theatrical and non-theatrical spaces. I want to play with expectation. Lately, I’ve been imagining performing it outside, in a field full of ruins, against an adobe wall or around fallen stones. And in caves, of course. I’d like to present my piece as part of a larger umbrella project called Faraway is Close. It’s the name of my creativity workshops, because sometimes our creativity feels so remote to us. Creativity is really so close to the surface though. I feel younger now. Doesn’t dance do that? I literally have so much feeling in me that I have to move with it. And it forces me to live in the present moment with such fluidity. When I was travelling, I really found my center. I think dance does that as well.